Busy parents often worry if they are reading enough to their children. 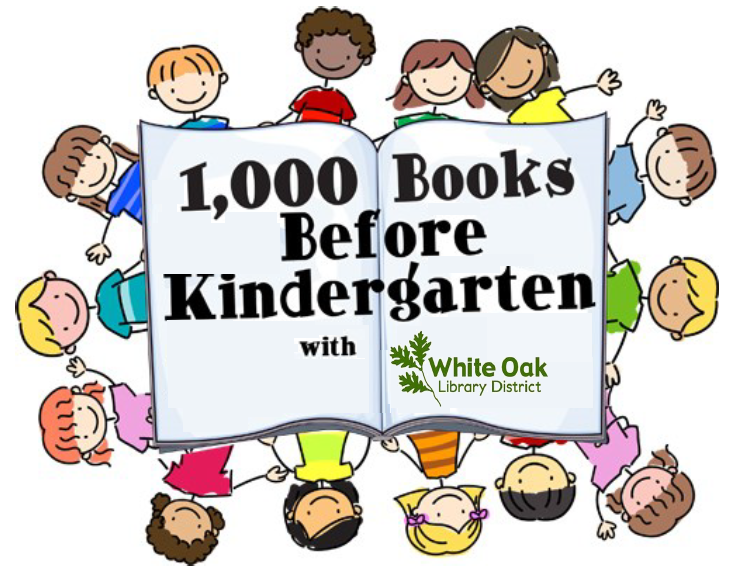 We have an easy way to keep you on track - the 1,000 Books Before Kindergarten initiative! Every 100 books earns your child a colorful sticker and recognition in the Library. Drop in and see what we have to offer! 1KBB4K starts the day you sign up and runs through the time it takes to read 1,000 stories to your child or they start kindergarten. Repeating stories is fine -- we know the little ones love repetition. It seems like a lot, but you can do it! If you read one bedtime story every night to your child for 3 years, you will have shared 1,095 books! Can I read any books? Even the same book over and over? You can read any book to your child from anywhere — libraries, bookstores, preschool, or home. Repeating books is just fine. In fact, repetition builds vocabulary and memory. Is there an end date to the program? It’s an ongoing program that ends when your child has read 1,000 books or enters kindergarten. Register: Pick up your log at any of our three White Oak Library Branches. Show Us Your Reading Log: For every 100 books read, bring your reading log to the Library to receive a sticker! Read More Books: Keep collecting log sheets until you reach 1,000 books. Celebrate! When you reach 1,000 books, receive your free book and certificate of completion.